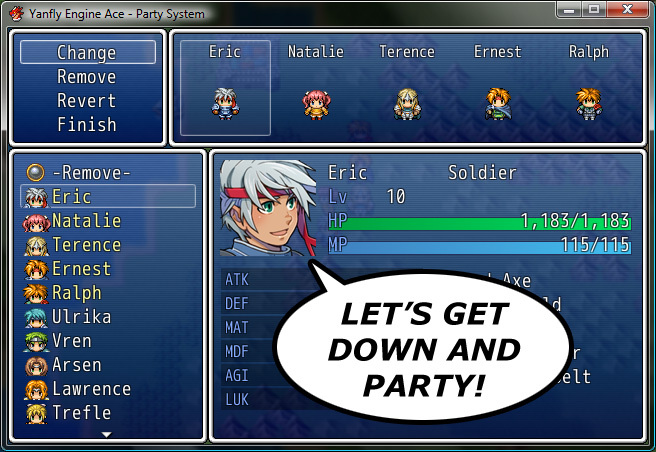 RPG Maker VX Ace comes with a very nice party system. However, changing the maximum number of members isn’t possible without the aid of a script. This script enables you the ability to change the maximum number of party members, change EXP rates, and/or open up a separate party menu (if desired). In addition to that, you can lock the position of actors within a party and require other actors to be in the active party before continuing. You can change the maximum number of actors that can enter battle at a time. In addition to changing that number, it will also expand the caterpillar (followers) on the field map to whatever that amount is. To change the number of members that can enter battle at a time with you, edit the MAX_BATTLE_MEMBERS constant in the module. The formation menu item will lead to the new Party changer scene. This scene can be disabled for those who wish to keep using the default formation system. However, those that don’t wish to use it will not gain access to the ability to lock and require actors (which will be discussed later on). 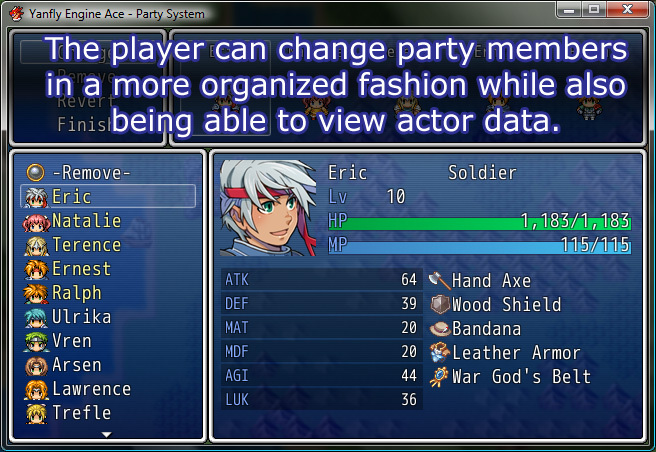 The player can change party members in a more organized fashion while also being able to view actor data shown in the lower right corner of the screen. One of the bigger nuisances for the default formation system is the lack of ability to view actor data before switching them in without having to constantly switch to the Status screen. This will save an extra step for players that wish to view the actor data. This will lock actor x in its current position in the party if the actor is in the current party. The actor is unable to switch position and must remain in that position until the lock is removed. Use the unlock script call to remove the locked status. This script requires the actor to have joined and in the current party before the script call will work. This will cause the party to require actor x in order to continue. If the actor isn’t in the current party but is in the reserve party, the party menu will open up and prompt the player to add the required actor into the party before being able to continue. This script call will not function unless the specific actor has joined the party, whether it is in the current or reserve. call_party_menu This will open up the party menu. This script call requires for the party menu to be enabled to use. 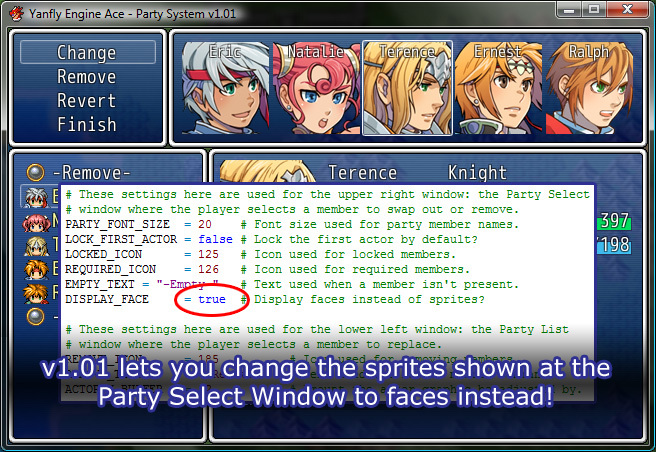 Version v1.01 lets you change the sprites shown at Party Select Window to faces instead! Change the DISPLAY_FACE constant in the module to true to show faces. Change it to false to revert it back to sprites. This is pretty sick. Does it automatically change the battle windows as well to reflect the new battle characters? I would find out myself but I’ll wait till the full version comes out. It does, but with the default battle status menu, it’ll scroll down as the newer member turns come up. OH.. QUESTION! i’M USING THE TAKESHI BATTLE SCRIPT AND THE PARTY SYSTEM DOESN’T SEEM TO WORK WELL WITH THIS?.. WHY?… PLEASE HELP. WHENEVER i LAUNCH THE GAME IT GIVES ME ERROR FOR ONE OF THE LINES OF THE TAKESHI SCRPIT.. MAYBE CAUSE ITS MADE ESSENTIALLY FOR.. 4 PARTY MEMBERS..? This script let you change the party members during battle or that is a feature that belongs to the Battle engines? I’m going to have that as an add-on for a future script. I’m planning on keep scripts lighter this time around so people who want to edit the scripts will have less to swim through. Thank you, you’re the best!. I’m using the one from BEZ in the game that I want to move to VxAce when it is released, and the layout shows the faces instead of sprites. It looks just like this http://i44.tinypic.com/339smm8.png (and yes that is spanish), could you add an option to switch between sprites and faces up there? Option added. Just redownload the script. It should increase automatically. Just make sure you have a 5th party member or else nothing will show in the 5th slot. ah it appears that although the event that adds the new actor has added the actor for him to appear in the caterpillar you need to ‘refresh’ the formations by changing the new actor for themselves before there shown in the caterpillar. Good find! I’ve updated the script to include the fix. Hello, I have similar problem with 1.08 version of script. I added your party script into my game “during progress”. Friends who playing my game has played more than 40hours and I am adding new features and content during their play. If I add 5th (or more) member into party, caterpillar does not expand (everything else is working fine including battle, reserves etc.) and I did not found way how to expand it. For new games it works fine. There is probably problem me and my friends had save game prior to your script included into project. Is there any other way to solve it without need to play whole my game from fresh start? is this compatible with the usual rpg vx? No, it is for the new one coming, RPG Maker Ace. If you are looking for a compatible Party System for VX made for Yanfly look for the Engine Zealous which have one. the next time just look on the tabs. https://yanflychannel.wordpress.com/rmvx/zealous/ I’m a complete fan of that engine. 2011.12.13 – Updated to provide better visual display when more than 5 pieces equipment are equipped on an actor at a time. v1.03 – Updated Spriteset_Battle to have updated sprite counts. v1.04 – Compatibility Update with New Game+. v1.05 – Bug fixed: Escape skill/item effects no longer counts as death. When I select Remove or an empty field in the Party List, happens an error . -Give the choice of don’t display the actor sprite in the list. -Do visible the selection field in the Party Select window only when you had selected any command, if someone is using a cursor mod, without modifying this the menu looks weird. -May you add “-In Party-” and “-Reserve-” tags instead of change the font color for the members in the party? I would do all by myself, but I have zero knowledge of scripting at this moment. Thanks in advanced for all. -Add the choice of don’t see the characters in reserve on the general menu, inventory, equipment, skills, etc. This bug doesn’t occur. You can select Remove on an empty field and no bugs occur. If you do, try a new game and then try again. Sorry, but I don’t see that as “I would do all by myself” when there are so many resources online to teach you this programming language. I was not requesting guides, but thanks anyways… I was asking you improvements for your system, then, will you include on your system some of my suggestions? About the bug, this is the message..
@Daem: It most likely is due to conflicting scripts (of other authors), since Shanghai didn’t discover any bugs in her test run. I’m assuming Yanfly is making something similar to Equip Skill Slots – in other words, other systems. It’s often tasked to the user to customize the scripts for the rest, however. Usually because they’re less important than the core system in general. Also, Shanghai is not Yanfly. Not sure how you’re getting the error for this but I attempted to fix whatever it is you’re getting. v1.06 – Bug fixed: Error with removing members. Furthermore, all features included in this script are final. Nothing more will be added. You can request others to add in the features for you. governs how much experience points members in the reserve get. None of the guys in the reserve (those not in the battle themselves) get any exp. Go to Database, go to the System tab, check Reserve Members receive EXP. Thank you a lot for your help and all your great scripts. Can’t the number of the maximum battles be changed here on the way by an event command etc.? Moreover, can’t a battle member duplicate member’s exchange be operated now by an event command similarly? v1.07 – New Feature: Maximum Battle Members Variable added. To use this feature, set MAX_MEMBERS_VARIABLE to a variable ID. 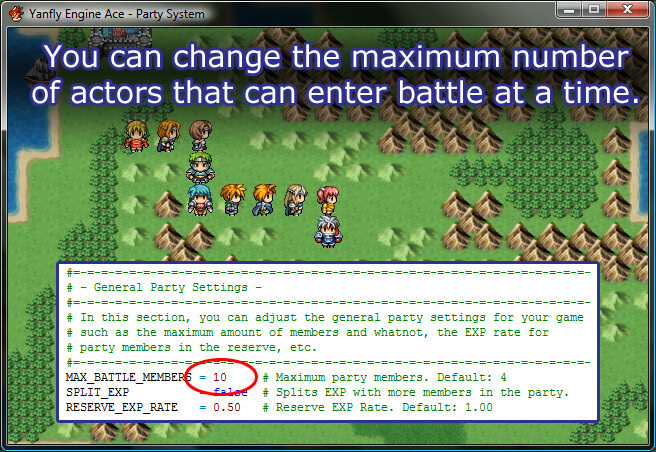 That variable’s value determines the maximum number of party members used in battle. Be cautious about using this during battle. Great work there. However, I am new to this, so how do you set MAX_MEMBERS_VARIABLE to a variable ID? Thank you for the quick action. the checking of operations of a battle member’s number change — it carried out. It is fortunate, if it cuts down with the battle member in another event and I also get a member’s change to inquire. Even if it is going to change in an event … In the present thing, the member whose row is the point will be pushed out and it will be added to a member. I am sorry when language is unclear. A request comes out [ made / it / have you ]. I’m actually unsure of what you’re trying to say. It’s okay to write it out in Japanese by the way. I can read JP a little. Though, if you do write back, I won’t be able to respond until later tomorrow (since it’s very late at night for me), haha. Can’t it carry out by script command? A lower text is written in Japanese. That can be used in a script call. Many things were considered and the support attack was completed. Yanfly, I have a good idea for this script. You might add an option to force to having a character of type “X” in the group or to limit the number of characters of this type that you can have.. For example, I want to have in my group formed by 5 characters 4 human characters and 1 troll by force. I can add the number that should want of characters, but there has to be always minimum 1 human character and 1 troll character, and also to be able to activate or deactivate this option or the types that must be. For example, this might serve for a system of pets. Only there can be a character with the type “Pet” in the group and debit of there being more of one with the type “Hero”. Another idea is that the quantity of the minimums and the maximums could be changed by a Variable, and another idea would be that the characters could have more than one type assigned. How to lock a member of the group? Bug Report: When there is an empty space on the current roster for shown/battle members AND there is actors in the reserve roster THEN you add an actor, the actor gets added to the shown/battle party, but on the main menu they are added to the bottom of the list (even though they might actually be the third member, they show up last on the list). v1.08 – Bug fixed: Party members are now rearranged when newly added. Is there a script call for a party roster menu? My intention is to use a script call from a conditional branch of menu choices to bring up a party roster menu. Is there a way to get a hold of version 1.07? I prefer the party members getting added to the bottom of the list instead of the top. excuse me. i got error message like this “stack is too deep” . “stack level is too deep” i mean. can put add-on? like a switch wether or not to activate change party in battle through event or script call in mid of gameplay?. when in battle if all active batle member dead its considered game over, even though reserve member still alive. can prevent game over and go to party menu instead? when in battle if all active batle member dead its considered game over, even though reserve member still alive. can prevent game over and go to CHANGE PARTY MENU instead? I tested your script, and I found ‘lock_actor(x)’ script call isn’t working as you explained on my project. I’m not using Yanfly Engine Ace. I placed your script at the top of ‘( ここに追加 )’ scripts array. And I was able to lock first actor using config @ line 120, and requiring specific actor using ‘require_actor(x)’ script call without any modification on your script. But ‘lock_actor(x)’ was not working. Could you check the line 392 and 402? Oh dear god, thank you for posting this Olive. I was worried that I couldn’t get the locking system to work. I nearly went nuts for a moment there. I have also tried to modify line 402 as you did to line 392 and it did, in fact, worked. Hopefully people would be able to see this to resolve their ‘lock_actor’ problem. This was a great help. Worked perfectly, thank you olive! Thank you so much, I required a bit of searching so time after this, so just thank you. For some reason, this was on line 343 in the script that I downloaded, but yes, it worked. I just wanted to post this for anyone that also can’t find it on line 392 or line 402. OH MY GOD THANK YOU OLIVE! I was so confused, luckily I saw this comment and it fixed the problem. Could you add a way to control the max amount of characters aloud in the party. I have it set to where the actors in the current party are locked at all times unless on a save point, which then you can change actors freely. Is there a way to let a user change the actual formation of a locked party? I don’t want someone to be able to change party members out freely at any given time, but to at least be able to change the formation of a party. Is there a way to determine ‘true or false’ if an actor is in the current party? Like say one actor is in my party but merely reserves. Is there a way to check that? To specify, I want the player to be able to choose their party but have the party members have their unique own dialog at certain places. So if this member is in the party, he says this, BUT if this member is in the party instead the he says this. Welp, I tried this with Tankentai ACE, and it keeps popping up with an error in japanese. Tankentai and YEA are pretty much 100% incompatible. You need to pick one. Actually, it’s just this that doesn’t work. Everything else works just fine. I just figured this out a while ago. You need to specify an actor position if your party has more than 4 actors. Go to the first page of Tankentai’s script, and the first thing you should see is the coordinates for actor positions during battle. You should add another set of brackets inside the larger set after the forth one, and follow the [+20,+15, 0] pattern (I think) to put the actor in proper position. I subtracted a little bit for each of the previous values to fit five people into the scene, so if you need to do that, go ahead. can you make a convoy character on the list like suikoden series please? and how i use MAX_MEMBERS_VARIABLE in the event ? i use MAX_MEMBERS_VARIABLE as ID on the variable and set it to 4 but my party is still 6 character after battle? how i can change the party from 6 to 4 after battle? Just a little bug : your script do not reconize when an actor have TP. Script ‘Scene_Battle’ line 318:NoMethodError occured. Okay, I need some help here. I typed in lock_actor(1) in a script call but it didn’t lock my character, and the character is at the top of my character data base list…. I have a question: Is it possible to increase the amount of battle-present characters ingame, like, for a single battle? And then reset it to the normal amount of characters? To clarify, at one point, the party (5) fights a massive beast, alongside two batteries of cannons, who will function as invulnerable, auto-controlled characters, that result in game over when the rest of the party is dead. Is it possible to change the number of battleworthy characters to 7, and then back to 5 before and after the battle respectively? In the comments, literally just below the section where you define how many battle-ready characters are allowed, there’s a section that lets you assign this to a variable. Sorry for the inane question, and thanks tremendously for making your in-script commentary so awesome. I’m going to try to do my script-comprehension at times that are not 3 in the morning from now on. Just delete line 392 completely and put ^ in its place. You can thank Olive for that little fix Yanfly seems to be ignoring…. I have 8 characters/actors made yet the menu only shows the ones in my current party. How to I make the others available to be put into the battle group? The menu doesn’t expand to accommodate everyone, but you can scroll down while selecting someone to view in the equipment or status screen. What I figured out short after posting was I just had to add those characters to the party, despite the battle group being at 4. So it all worked out. that’s a completely different script. It’s still Yanfly’s so it shouldn’t be too hard to find. Script ‘Animated_Battler’ line 190: NoMethodError occurred. Is there a way to make it compatible? How did you fix this? Having similair issue. I love when people don’t follow up with how they fixed it! Question: Im currently overseas and cant access my Ace right now to check (using public internet now), but is there a way to change the face pictures shown on the lower right hand side box that shows the stats and equip to actor portraits instead? Hi Yanfly, ty, for all your nice work, im having a problem, i have your battle ace engine and the ace engine, i want to use your party system but when i plug in the script an error ocurs at the start of battle saying error in line 2743, undefined method ‘move x’ for nil:nilclass, can u help me please? Sorry i now solve my problem, im usin jet’s simple sideview, i just need to put jet’s at the bottome of the list and all your’s first, now problem solve, sorry for bothering, good luck, awesome work, i love your scripts. We do not support tankentai. You need to go into the first page of Tankentai’s script. The first thing you’ll see is the coordinates for actors in battle. Each set of coordinates is for party members 1, 2, 3, and 4 in order. Just add another set of brackets after the forth one, follow the pattern in each of the coordinates (I think it’s something like [+20,+15, 0] maybe) and there you go. All you need is coordinates for each actor based on your party size, and there’s no problem with the script at all. You can also proportionally decrease the values for all of the coordinates to squeeze in more people. How do I erase the second instance of -Remove- in the formation menu? But I don’t want the second -Remove- to appear. How do I remove it? Just because they aren’t in the battle party does NOT mean they are not in your party, there is no bug with the script it is your misunderstanding. Why all the scripts must be in rb. files? You can easily open them with Notepad. Thanks, i don’t need to scream by anger for trying to use “eRocket”! i got a “sprite initialize” error when i tried to change max battler members to ‘6’. everything was working fine when it was ‘5’ members. How can I force to switch party members? I want actor X to be in position Y, but with an event command. Can I do this with, don’t know, script call? Not sure if anyone else is coming across this issue, but when I add an actor to my party, all is good. But when I remove an actor from my party back into my reserves, they are out of the group and out of battle, but their portrait still shows up grayed out in the menu, how to I fix it so their portrait does not show up at all in the main menu? Clear as day, I put in the script lock_actor(1), and still that actor can be switched out, and I have the party system enabled. I even locked all the actors and I could still switch them. So I was wanting help. Nevermind, read the comments for the solution. Hi, is it possible to hide reserve party member completely in general menu, instead of just gray-out? Thanks in advance. of sutent cancer drug, thanks so much for posting about it. Go to tools then click database. From their go to the right and hit system. At the right on this page it shows options. Under the list of options it shows a box and to the right it says “Show player followers” un-check that box and your followers will not show up on the map, but they will be there. I can’t get this Party system script working together with Battle Symphony, if I choose to have more than 4 characters in a battle. With 5th character, game crashes at the start of each battle. It’s not this scripts fault, is it Battle Symphony’s. Battle Symphony doesn’t support 5 characters at once then. I would post this problem there. You’ve got to add coords for the position of 5th char. You can still have the actor appear for cutscenes within an event. yea, that’s what i’ve figured. anyway, thanks. The way VX ace works always the highest “position” will get used as leader -> If you want to keep actor 4 as front actor just put him in slot 1 and lock him there, that should do it. If you still get any problems with changing actors that’s probably a problem with the script as it worked fine for me when I tested it like I noted above. Me too, tried everything to fix it, not working, player is above in priority in the database, and a lesser player is overtaking the locked rank 1 priority character in the party menu, which effectively changes the caterpillar and so forth. Here’s what happens to me, I start the game solo, leader is position locked properly with the gold star, I add a player to the party, he takes leader position without a lock, but can’t change formation with intended leader where he remains locked but now in slot (position) 2 in the party menu, adding a 3rd and 4th party member both work as intended and below the priority lock, it’s just the first addition to the party that fails. I’m getting in error. Someone please help. Whenever I enter a battle I get this. Script ‘Sprite_Battler’ line 80: TypeError occured. Could you please explain a little more? Actor Position where exactly? It depends what battle script you are using, I am using Yami Battle Symphony. So the side view error occurs if you do not input the coordinates for each and every member. any idea how I can fix it so Party System works with Visual Battlers? Referring to my problem. I’ve fixed it, but only through setting up my parties a different way, which rippled through the game and caused me to have to change a lot of events. It’s a bug in the script, it must be. That’s why you always have to choose the scripts first before start eventing your project. it’s not a bug (100% sure :D). it set that way. if you lock the actor in slot 4. but you don’t have actor in slot 1,2,3. then of course it will add the actor in slot 1.
and by default it will search the lowest index as the leader. and if you see in the scene we can left the slot 3 blank but still have slot 4 have actor. it’s your fault from the beginning. why didn’t you lock the actor in slot 1 instead of slot 4. :D.
i also found yanfly apporach by letting the slot 1,2,3 empty is good. since i can create my suikoden formation system because of that. Can you forcibly remove an actor, and replace him/her with another? For example, an actor summons a character to take his/her place, and at the end of battle, replace with the summon, with the summoner? Is it locking the 1st actor? If so, you may just need to add actor 9. If not, try the suggestion Olive gave, start a new game. Also are you getting an error? You may be editing the wrong part of the script. Both Actor 1 and 9 are part of the party when the script runs. No error, just not locking. The script runs at the beginning of the game (after the actors are added) so I always end up testing it by running a new game. I have a simple question; can someone give me an example of using the require_actor script call? How to, or when it would be a good idea to use this. @Healey1991: Ok, did you change (actor_id) => (actor) or (actor.id) => (actor)? recommend using another party script (if there is one). Took me a while but finally resolved the issue. I was only changing the script at lines 392 & 492. As soon as I changed every instance of “actor_id” & “actor.id” to “actor” between lines 386 & 428 everything worked fine. I didn’t think I needed to change it for require_actor but apparently I was wrong :P. Thank you so much for your help! Hey no problem! I’m no scripter but i’m glad it helped. I can’t remove actors permanently. I reached a point in my game’s story where the main character is supposed to be alone, and I’ve tried using both the RPGM event command and a script call to remove all other actors. They go away just fine, but their followers remain. Also, as soon as I gain access to the party window again, they’re there again, and automatically jump into my party. So I have one person, being followed by two people that don’t exist, one other person joins me, and all of a sudden I have a full party of three with one reserve. What do I do?? Have you tried turning off the followers? The ‘Change Single File Walking’ command? How to configure party position in battle? i want to add 9 party member in battle, what part i need to edit? Is there a way to set it so that you don’t see characters in the menu that aren’t in the party? Because even if I only have one party member, I can still see all others greyed out in the menu. It’s not a big deal but would be nice if there was a way to change this. I’m getting an error for Line 120: NoMethodError occured. undefined method ‘’ for nil:NilClass. 1) Is there a way I can check if [actor X] is in the active party or reserve party using Conditional Branch? 2) Can I force an active party member into the reserve party? I have my max party size set to three, and I have the faces centered. When I go into battle, however, when someone attacks, it creates an extra image of the actor in front…. I’m lost. What do the “aligns” do? Is their a way to make it so the fifth slot is sorta like a guest slot? I want the last slot to be a slot where only a specified person can enter and you can’t mess with that character in anyway. Sorta like Final Fantasy XII. Hmm, I looked but saw nothing. Using Symphony, when I alter the party, it still does turn order by original party formation, not the new one. Am I missing something? Ah, nevermind. there was another script that allows you to fill formation with an empty space. THAT was causing error, we good bro! Is it possible to remove the two -Remove- commands from the party member menu completely? In my game I need to be able to change between my party members, but the party size can never be smaller than 4. Could you make an add-on to this script? remove_actor(1) so that he will still be in the party but not be one of the active battlers. Hey there, this script is absolutely great!! I love it! But, there is one bug i think. If i set ENABLE_MENU to false and use the regular formation menu, it does not affect the order in which the party members walk. It looks like Yanfly isn’t continuing work on this, but I have a bug to report anyway. I want to use the MAX_MEMBERS_VARIABLE to have my max number of party members change whenever I need (it works fantastically mid-battle by the way, even works with other scripts), but I do not want to use the whole party formation menu that comes with the script – all I need is the default way to switch formation that comes with Ace. However, when I make ENABLE_MENU = false, it doesn’t properly default back to that. It looks like it does in the menu, and the position in the party moves as it should, but the character displayed does not change, and it does not do anything to switch their position in battle. I am having this same issue, have you managed to fix it yet????? I don’t think I’m doing anything wrong but the download link does work, well like it pops up and like ‘save link’ go to folder its in but when I click it it says its not a file or the file is not found (around those lines), help? Is there any way to detect if an actor is the active party? I don’t want to require a character, just have something happen if they are an active party member. Any ideas? I’m am using tankentai, but only with 4 party members in battle. I just want to use it as a party switcher. Would there be any way to add bonuses based on which position a character is in the formation? For example, receiving a defense bonus for being in the back row during combat. Hey Yanfly! I love this script, as I do all the ones of yours I use. But I have an issue, the script command lock_actor(x) doesn’t work for me? to use lock_actor(2), it doesn’t… well… LOCK him. The menu IS enabled and he IS in the party at this point, so I was hoping you could help? Ignore my previous comment, I’ve looked it up and found how to fix it. It seems to only happen when i remove a character in the formation. When the formation has all current characters in it it tends not to crash. I’m using the yanfly battle script and yanfly visual battlers. Any input is appreciated. I’m curious as to whether I can make it so that the party members who are not active in battle are not accessible to use skills from the menu. I keep getting a line 667 error ” draw_icon(Icon.locked_party, rect.x+rect.width–26, rect.height – 26) ” I know this isnt a script confliction problem as i have tried running the script in a new project. This script would be awsome if i could get it to function. any help? I can’t lock :( I changed de line 392 and still don’t working! help! hi are you good at scripting can you try n find if this script works with victor scripts i cant enter battles when i use this script and i want to have a FF7 type party system like a check point to change members only and no change members in battle or from the menu. I am getting this error while testing this specific script: “Script sprite battler line 80: TypeError Occurred” when I start a battle. I have 3 scripts in, the side view battle, Command Party and this one. I don’t know what to do. If you can at least tell me how to have your script call for a different sprite sheet at the very least I’ll take that. Cool script! It’s one I will most certainly use. I only have one problem though. The use of ‘call_party_menu’ is linked to the ‘ENABLE_MENU = true’. I do not want to allow the player to change the formation in the game unless they talk to some special NPC (like an innkeeper). Any way to change this? Right now I’m using a common event system which changes dead characters into the coffin sprite. But if the lead character is dead, then the party is led around the map by a mobile coffin. Could I use this script to automatically send dead characters back in line so a living character is leading the party? I doubt anyone will bother seeing as how support for this script doesn’t seems to have stopped (understandably so). I figured I’d ask anyway. Is there a way to enable a party member without directly adding them to the party first? I would like to “enable” characters that can be added to the party, but not right away. Like, after you help them, you can then go into the menu back at the home base and select them from the list of available party members. I love this script, but I have two requests to make it perfect. it. 1. A script call to require a number members for party. 2. An option to to HIDE the reserve members from the regular menu. For default, they appaers transparent. I hope it still gets updates as the swap members snippet. Dropbox is giving me the “too much traffic, can’t let you download this Star Fox” type error for me. Bummer. ^ same on my end, Vidiotdragon. Found the other download for it. And… sorry to sound completely noobish, but how does one Lock, unlock, require, and unrequire players? Can’t find in the code where to put it. Mind sharing the other download? Has everything, to my knowledge, but you gotta manually input it. They are not all there, do you know any other mirror to this? Okay nevermind, I found the links in his news about dropbox down. However, for some reason he didn’t upload the Party System first before all the add ons for it. That seems really weird. I would very much like to download this script and use it in my project, but it is still showing a Dropbox Error (509) due to overuse. Can someone please provide another link? Thank you. Could we see a mirror download? It’s gone and I need it for a game dev contest. I love this script! Thank you for making it, though I have a quick question. Is it possible to have it where two party members cannot be in the active party at the same time? In my game there are two characters that start off disliking one another and I thought it would be a fun challenge if you had to build your party around this problem. Thanks again for this awesome script. I really like this script and the other scripts from here. But I have a problem with the party system script. It works for me, but when I have locked an actor, its impossible to unlock him. It seems the unlock command doesnt work. Have anyone a similar problem or a solotion for that? The party system works like a charm, but I do have a question to ask. I hope somebody on here can help me figure this out. I want to set up a variable that sets the value to the number of “active” party members and not the entire party. What I mean, for example, if I have party size of 5 and I have 8 members on reserve and I decide to put 3 of them in my party, I want the variable to recognize that I’m using 3 party members, instead of just saying I have 8 party members. Is there a way I can set the variable on some sort of common event every time I change my party to set to the number of players I’m using currently? Did you ever figure this out? I’m looking for the same thing. can someone post the script because the one from the link above is only for five people in your party or if im looking at the wrong one could someone tell me where the right one is. the script is now working but usless to me when i dont have a choice to enable or disable party system from menu with script call and is yanfly dead? bc s/he stop helping anyone and doing nothing else. i hate super heros that sit around and do nothing and wont help others, just like when people make scripts and dont help others. Script ‘Sprite_Battler’ line 80: TypeError occurred. what line is the total = $game_party.max_battle_members script line? This computer is still a new computer with much to learn about moving on the Visual Battlers script! How do I teach it how to work with both this script and Visual Battlers? This might be done before, but it’s new to me. I want the party-swapping to occur only at certain maps, such as a headquarters or camp, instead of having it done while exploring or in a dungeon. Is there a way I can do this? A mi me dio error,borre sin querer una parte de otro script y no me acuerdo que ponia lo que borre,¿me ayudan? Nice, I really like it. Ehrm… I am really a noob with the scripting part of RPG Maker so I have some kind of stupid question… What can I do if I want to make the party menu unavailable when the character enters to X map? And then, how can I make it avaiable again when he goes out of the same map? Pretty useful script, but one observation: When a party member is set to “required”, you can’t even shift their position within the active party. They might as well be “locked”. who i do to removes the Removes from actor list and the command window? Cant use it it. my game adds a party member at the start and they dont appear. Is it possible to use this for the opening Character Creation Screen where they select from a list of character to create their party of 4 or 5… And not have access to the system after this? When I’m trying to use the Swap Fix add-on, it tells me there’s an error in the “Game_Actors” line which it then directs me to this “return nil unless $data_actors[actor_id]” … i put the add-on script at the end of the Core script, although I’ve also tried making a new page for it underneath the Core script, I’ve got no clue why it’s not working..
so i feel like a noob, but I’m struggling with MAX_MEMBERS_VARIABLE, in that the line is causing my game to crash on startup because nil is not defined for . What am I doing wrong? I apologize if this is a noobish question, but where should I place this in the script editor? When I make multiple party members the party (excluding four actors) vanish, but they still function. Is there a way to fix this? “Script ‘Party_System’ line 208: NameError occurred. Anyone know how to find the currently active party members via a script call? Like maybe put the actor id for each slot into a variable? I then just did the long form version using a series of conditional branches and variables so if Actor X was in party then variable x gets affected, etc. etc. A bit long, but I’m still brushing up on my scripting so it technically works. However, without the Yato snippet, the Yanfly party system considers everyone in your reserves as an active party member. Depends what you mean by find… I’m guessing you mean determine which actors are in the current party? I’m a total Ruby newbie too, no worries. So put that Yato snippet in as a separate script (not sure if it can be used for commercial games btw). Once that is part of the game the yanfly system differentiates between active party and reserve party. (Don’t ask me for an explanation of the mechanics). The I would think the easiest route would be a conditional branch > Tab 2 – Actor X is…”in the party” > turn on a switch that can then affect other branches. 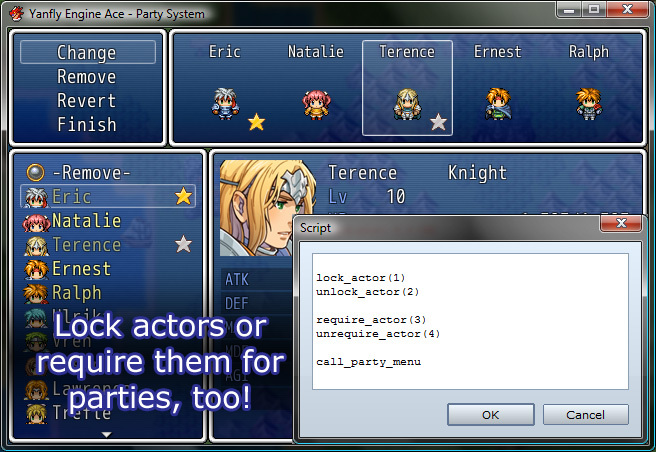 The Ace eventing functions already have a way to check if some actor is in the party, no advanced scripting required. Thanks for the explanation. I suspected this might be the case but that left me wondering then how to determine if an actor is in the reserve party. Basically, with this script an actor can be one of three states: 0 – not in the party, 1 – in the active party, and 2 – in the reserve party. So we can apparently differentiate between 0 and 1, but what about 2? At this point it’s pretty much hypothetical since it’s not really something my game mechanics need at the moment, so if this works well enough to find the active party members I’m good to go. Admittedly I havent had a chance to test this yet. Anybody for a fix for this? When I get a fifth party member, ingame, it does not show the 5th party member. I have the MAX_BATTLE_CHARACTERS variable in the script set to 5, but the 5th one is not being rendered. They show up in battle, save file, and party menu. Help? I’m a total noob when it comes to scripting, how do I access the party member swap in battle? When I play tested after putting the script in there wasn’t a “formation” or “swap” command during combat, how do I put one in? Forget my previous comment, I put in the add on and now it works. My new issue is that even though it is compatible with the Aeon Party script by Fomar0153 which is a Final Fantasy 10 style summon system, when trying to swap party members while an “Aeon” is summoned the party swap menu cannot be exited. Can this problem be fixed or worked around? or am I going to have to pick one or the other? Hey! Is there a way to only show the party members that are currently in your party on the main menu? In the game i’m making, you capture monsters and add to your party so having a the menu display 20 characters when you can really only have 3 in your party is kind of annoying. Thank you! Hi, sorry if I posted in the wrong spot, I have not really posted on a forum before. I’m pretty new to RPG Maker, and I’m already a fan of the Yanfly scripts. I have figured out how to transform player actors into other actors (Like an actor shape changing into an animal) using skills, states and a common event. I wanted to try out the Yanfly party system and found that when an actor is removed from the party line up, it is swapped to the next slot when the transformation takes place, booting out the actor that was previously in that same spot. I was wondering if anyone had any ideas how I could fix this. I’m very fresh to the community and appreciate your insight and patience. 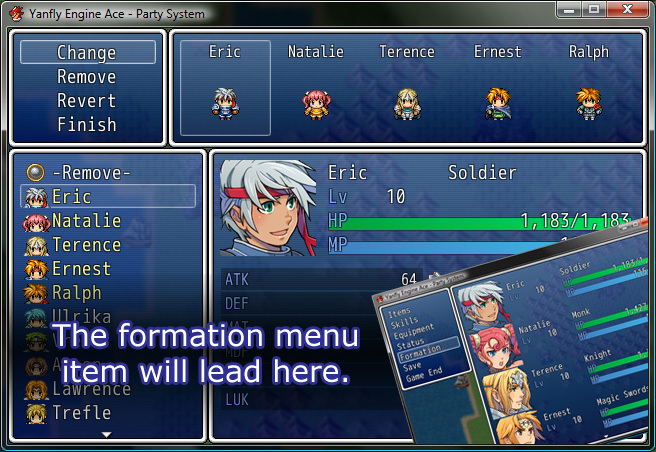 Sorry, I am using RPG Maker VX Ace of course, and am using 4 party spots with about 10 characters in all to swap between. I’m not sure if there’s an easy way to show how I have the events set up, maybe a demo? TDS wrote this little snippet last year for this issue I was having with summon monsters. Well I think this is it. Stick it right below Yanfly Party System and see if it helps. to a different value? I swap to smaller sprites on the World Map and they won’t line up properly in the Formation window. If I add padding to the spritesheet itself, the sprites float an entire tile above their actual position, so that’s not a solution. I did try to remove the original character first, then add the transformation character second. The order of which the swap takes place seemed to keep the actor in the same slot without pushing anyone over. I did try the script you left and agree that the actors in formation did not align properly, however I did try to play around with the script and could get it close to aligning properly, so I’ll see what comes out of that. I appreciate your time and suggestion, it got me farther than before :) Thanks a lot. Okay, I’m having a problem. When I add a party member, the character in the first slot automatically goes to slot 2 while the new guy goes in slot 1. The guy who was there first is supposed to stay in slot 1 the entire game, so he’s locked in, but now stuck in slot 2. This only happens when my Max Party is set to 4, and setting my Max Party to 5 seems to fix this. Now they swap places if the max party is 5, but switching to 4 fixes it. None of the scripts should be conflicting. They are all Yanfly scripts except for two related to dual wielding weapons, one that creates unskippable text, and one that adds a sound effect to text. How can I put the option to lock among Change, Revert and Finish? The new member added tot he party but the caterpillar/followers remains the same… How do I fix this? I want the new member to join in the party as well..
Nvm I just need to new game..
All party members who joined the party but does not equipped is considered being equipped in battles!! For example, if Actor A is inflicted by a state it will trigger an event in a battle (I’m using the starting state script)… In this case, I dont equip Actor A but the event still triggers! That means, although Actor A is not equipped in party, the game still think he is in battle! Please fix this, Thanks a lot. I want to create an event where the event progression depends on which party member I take in battle. For example, actor A and B are locked party members while the slot for C and D are optional and can be replaced with E, F, G, or whomever I already recruited as allies (just like the ones in suikoden series). In some event, the event would require F as a battle member in order to proceed. But since recruiting with this script counts as having F in party member, the event will proceed even if F is not in the battle party. Can I somehow find out who the current partyleader is? I mean, I want one of my characters to be able to walk through lava but only if it’s the active player character and I don’t really know how to find out if this person is active. Can anyone help? Yes so I’m currently trying to get this script to work for me and I’m running into 2 issues which I hope someone can fix. First problem is the actor I want to have locked in the party is never being locked in. I’m not sure if I’m using the lock command correctly but every time I try to lock in 1 party member, I can still toss them around and swap them out. The second issue which I may have missed a solution for is having it so only active party members will show on the main menu. Don’t really want inactive members being shown on the menu when they are on the side lines. Thanks for your time and if you need anything else to help you solve the issue let me know! That’s not a group of adventurers.That’s a conga line. Script ‘Yanfly Battle Sys’ line 1627: TypeError occurred. I added the swap order fix that was posted above but I get this error after swapping once and trying to use the swapped character. Is there a possibility of changing the ‘MAX_BATTLE_MEMBERS’ (in this script) in game with a script call ? ‘YEA-Party System’ line 366:NoMethodError occurred. Hello, could anyone give me the Swap Order Fix script? It is that it has been removed, and I urgently need it. Is there a command to check if the character is in the group that enters battle? For example, when I left him in the reserve, I wanted him to leave the group and walk around the room. Being in the “main” group he would disappear from the room. In the case I have three main heroes for battle; the intention was to check if the character is among these 3 and create a condition … Or is there a way to theoretically remove the members left in the reserve (not appearing even in the menu so it would be possible to use the default condition of the maker)? Converting VX Ace games to MV! THE RPG MAKER CHANNEL EPISODE 7!!!!!!!! The RPG Maker Channel Episode 4!!! !